I’d like to say that Christmas snuck up on us this year, but it didn’t. It seemed to come right out of the blue, crashing into our lives with the realization that, “Holy crap!” it was just around the corner. It’s not that we didn’t have plenty of warning as the snow has been falling here pretty steadily since the first week of December, and we’ve had some very cold days. We also got our outdoor decorations up earlier than usual, but still none of it seemed real until the big day was less than a week away. We’re in the swing of it now though with the missus baking cookies, me baking tourtières (French Canadian-style meat pies – a Christmas staple in this part of the country), and favourite Christmas tunes are playing on the stereo. All of which makes me think about just how damned lucky we are. Some friends will have an empty seat at the table previously occupied by a loved one who left us this past year. Neighbours who are experiencing hard times will be looking sadly at trees with little under them for their children. Still others will be totally alone for reasons varying from work obligations to personal misfortune. Some we can help by giving, others by inviting them into our homes. And for others we can but try to lift their spirits by wishing them Christmas greetings from the bottom of our hearts. And if there is any ‘magic’ in Christmas it isn’t Santa (although he’s pretty cool), it’s what happens when we rise above the hurly-burly of our own seasonal celebrations to give and share with friends, family, and even strangers who often want nothing more than to be able to wish a Merry Christmas in return. May all the joys of the season be with you and yours. Even if you’ve never experienced it personally, you’re familiar with all the typical negative adjectives describing winter – drab, dreary, monochrome, white, cold, freezing, dark, grey. The list, like the supposed number of Inuit words for snow, seems endless. Except for all the lights during the Christmas season, colourful is rarely heard in a winter context hence Martha’s (Wisconsinland) challenge to find and share some winter colour. I’m still cleaning up here after 2012’s devastating wind storm (links here, and here) which involves a lot of burning. For obvious reasons the dry summer months are not ideal, but when the ground is covered in snow the fire hazard is virtually non-existent and I can make hay, so to speak. So for the past couple of weeks this has been the colour of my winter, with an added bonus of heat to warm those chilly hands and feet! We’d had quite a bit of snow over the past week so today it was time to get out the winter wheels (aka ‘Big Joe’ of Shake, Rattle and Roll fame) and have some fun. Big Joe is about 25 years old - I picked him up used in the early 90’s - so he’s no spring chicken. But he’s very reliable. I tend to abuse him somewhat, leaving him outside year round and generally ignoring basic maintenance, but fill him with fresh gas, hit the starter, and he’s up and running! I only wish all my mechanical equipment was so reliable. But that does remind me: it’s been about 5 years since I changed the oil so I must make a point of doing that soon. And a tune-up wouldn’t hurt either – at least a fresh plug. Later. I bundled up against the cold (about –25C this morning) and headed out. Parked beside the garage and covered with snow he was hunkered down against the elements, but after a quick brush-off Big Joe started right up and we were good to go and play in the snow for a while. Unlike some (many?) of my readers I own very little cold riding gear; actually I have none. My only nod to riding in near-freezing temperatures is to throw on some long johns and an extra sweatshirt under my jacket. I’ll also wear my full face helmet so my visage doesn’t lock up in rigor and I end up at my destination looking like a bald Joan Rivers with too much head and too little skin. So when I saw Sports Experts advertising a store-closing sale I thought I’d see if I could augment my cold weather gear with a new pair of Helly Hansen’s (or similar) thermal underwear at a reasonable price (i.e. cheap, big spender that I am). The young salesgirl’s reaction when I asked to be directed to their long underwear rack was akin to me having asked her to explain the over-arching theory of nuclear thermodynamics in 5 minutes or less. I stood corrected. The ubiquitous underwear, trollies, gotches (or gotchees), drawers, skivvies, or Reginalds are now ‘base layers’. And the marketing wallahs, once again, have managed to upscale their product in order to be able to charge outrageous sums for what really amounts to a flimsy bit of polyester. And yes, I am now the proud owner of a new pair of base layers. Wait, is it a pair still? Or is it just a base layer? This is so confusing. Don’t you wish all motorcycle reviews were as funny, informative, and totally refreshing as this one? With riding season now at an end for a few months I get to catch up on my reading, tackling some of the pile of books I have managed to amass which threatens to topple over causing grievous bodily harm to the unwary. The Monuments Men is my current read. It contains nary a mention of two-wheeled motor vehicles so it is not a “motorcycle” book, but it is a great story nonetheless. The “Monuments Men” were a little known group consisting of a small number of Allied soldiers tasked with the responsibility to protect, to the extent possible, all the cultural treasures of Central Europe during the latter months of the Second World War. I’d never heard of them before and, for that matter, had never really thought about it, but when you consider the destruction wrought on so many cities during the war the fact that any artworks remained at all is in itself amazing. Although they had a mandate from President Roosevelt and the support of General Eisenhower the initial team of a dozen or so men had no specific orders or logistical support once in the field. They were on their own, scattered across Europe, competing with operational needs while trying to follow the advancing armies. Transportation was usually by hitching a ride with someone going, hopefully, in their general direction although abandoned cars and bicycles were also commandeered when possible. Once in theatre these men had to convince field commanders to protect priceless cultural artefacts from the ravages of battle, looting, or the wanton destruction caused by retreating armies. They were of low rank (Private through Major) so moral suasion was their only tool to accomplish this. Sometimes it didn’t work. Other times they were too late, able only to document the ruins. But often enough they managed to convince commanders to take a particular course of action that would preserve an historic building or work of art. In the process they also uncovered vast treasure troves of stolen paintings, sculptures, gold and silver. These, and other artworks, had been systematically looted by the Germans from museums, private collections, and Jewish homes. Intended to become the greatest collection ever amassed, representing the magnificence of the Third Reich, these artefacts had been stored in basements, abandoned mines, and remote hideaways while Hitler awaited the construction of his Führermuseum in Linz. It was an incredibly daunting task, and dangerous - some Monuments Men lost their lives in the process – but the very fact that we can, today, go into the Rijksmuseum in Amsterdam and see Rembrandt’s Night Watch, or view the Bayeux Tapestry at its home in Bayeux, or even experience the Louvre’s collection is a testament to how extraordinarily successful these few men were. It’s well worth a read. Highly recommended. The sun is losing its edge, no longer sitting so high in the sky. Its weakening power is seen in shorter days and sharply slanted rays – even at midday. The dark comes at 4PM now, a full five hours sooner than just a few short months ago. And mornings arrive with ice on the pond, frost on the cars’ windshields, and perhaps a sprinkling of snow on the ground. The feel of winter is constantly in the air. We live in hope of that occasional, spectacular autumn day when the inexorable movement of the seasons seems to reverse itself, even if only for a few hours so we can have one more ride. But the odds are increasingly stacked against that happening as we move into late November. I managed to use the one nice day last week (nice being above zero, not raining, and not too windy) to give my bike its final bath of the season. But even that was just a lick and a promise (as me dear old mam used to say), enough to get the bugs and mud off, little more. It’s now tucked away in the garage, battery charger connected and fuel stabilizer in place. There are a few maintenance tasks to be done but I think I’ll wait with those until the depths of January/February when my need for a motorcycle fix of any sort will be at its highest. Spring will, by then, at least be visible on the distant horizon. Meanwhile we hunker down to wait, dreaming of warmer days and envying our friends in warmer climes. Try not to brag too much please. I saw this over at Bikes in the Fast Lane today and just had to comment. Seems like a good idea, right? And, really, how can one argue with protecting babies and young children – it’s motherhood and apple pie. But think about this: in the event of an accident this car seat won’t be ensconced in a more or less crush-proof cabin but will be anchored to the outside of 800 or more pounds of sliding, bouncing, shredding metal, hot engine and spilled gasoline. And that’s not anything I’d care to contemplate. Even if no disaster were to occur, proper riding gear is simply not available in those sizes. Eye protection would be compromised and any helmet would be too big and ill-fitting (to say nothing of the strain a heavy helmet puts on a still-developing neck and spine). I know we all want to share our passion for riding with our kids but wait until they are old enough and mature enough to hold on properly, get them the best protective gear, and enjoy our great sport together, in safety. A car seat bolted to your luggage rack is not the way to go. Yesterday I received a box of books previously owned by a WW II veteran who died earlier this year. An avid reader of military history he had accumulated quite a collection over the years, many of which meshed with my own interests, specifically the stories of the men and women of The Great War. Students of military history can argue over the tactics and strategies of war, but in the end the stories that resonate, that stay with us, are those of the people who lived, loved, fought, and died in the trenches. The second decade of the 20th century was a different time, a time where 17 and 18-year-olds weren’t consumed with playing at war through increasingly violent video games but were actively embroiled in a deadly cauldron of brutality none of us can imagine. Those that survived didn’t come home to psychiatrists, psychologists, and trauma councillors, but to families decimated by the loss of loved ones and a war-weary country that had just lost the better part of a generation. Most held the horrors they experienced to themselves, burying them deep knowing, and rightly so, that we would never be able to understand. Still they went on and farmed, worked, married, and raised their families. They were our grandparents and great-grandparents and, compared to the stereotypical self-indulgent youth of today, made of sterner stuff. Historians claim that Canada’s future was forged in the crucible called Vimy. That may be so but it was only part of it. With nearly 10% of the population in uniform, and nearly 3% of the total population of the country killed or wounded between 1914 and 1918, the impact on the psyche of the nation cannot be denied, even to this day nearly a century later. And so it is with those thoughts in mind that I shall remember all veterans as we come up to another Remembrance Day - John as I read his books, my father and grandfather, aunts and uncles, and the hundreds of thousands of other men and women who have, over the years, fought for this country. Some made the ultimate sacrifice; others survived only to live with physical and psychological scars that affected their quality of life forever. All gave up more than we will ever know. They all deserve our undying gratitude and respect, not only once a year but every day. Thank you. It started – and ended 8 days later – in Las Vegas. Now that we’re back home and getting over the jet lag and red-eye experience it’s time to look back on our trip and start the daunting task of wading through thousands of photos and dozens of video clips to try and reconstruct the highlights (of which there were many) of the past few days. But first I want to acknowledge the folks who made this possible for us – the people at EagleRider Motorcycles. F rom the get-go they were helpful and accommodating to make sure we got the trip we wanted. The local staff in Las Vegas were efficient and friendly and the bikes were well-prepared and in good condition. The arranged accommodations were all easily accessible and well suited for biker travel. I can’t attest to EagleRider’s problem-handling capabilities as we didn’t have any issues but I would certainly use them again, they were great. The weather. What is a motorcycle trip without weather? Being exposed to the elements is one of the factors that makes motorcycle touring what it is. That the elements may turn nasty on occasion comes with the territory. All week we were on the edge of those storms pounding parts of Colorado so we had more rain that we would have liked. But that was more from a road safety perspective than anything. Neither of us were that familiar with our bikes, especially under fully loaded and wet conditions, and that was a concern at times when the weather got really heavy. But for the most part it was a minor irritant and actually lent some character to a lot of the places we visited. And the fact that there was a lot of cloud kept the desert temperatures to a reasonable level and reduced the risk of sunburn and/or heat stroke, so it wasn’t really that bad overall. The geography. This entire area is simply mind-boggling. Never exposed to the grinding, crushing motion of the great glaciers this part of America was sculpted by different means and the results are at times surreal and always incredible. Every day brought something new and different and it was a thrill just to ride through it all. I certainly can’t do it justice with mere words and 2-dimensional photos so if you’ve never been to this area make plans to go now! You won’t be disappointed. But if you can, arrange to do so outside school holidays. The crowds were small most places but the ubiquitous rental RVs where everywhere and I can only imagine how painful it would be riding behind a row of 10 of those monsters being driven at 15 miles per hour under the limit through some of the canyon roads which we enjoyed in relative peace. The bikes. As I noted before we had rented Electra Glides for this trip. While we both took some time to get comfortable with them (me more than my brother because he already rides a Road King) they turned out to be the perfect choice. At 75-80 mph on the highway they were as comfortable as sitting in your La-Z-Boy watching the world pass by on a big-screen TV. They just ate up the miles in total comfort for both rider and passenger and will be my bike of choice should I ever undertake such a trip again. In the city however, it’s a different beast entirely. Heavy and not very manoeuvrable (partly due to my lack of experience and fear of dropping “someone else’s” bike) it would be like owning a Humvee just to do the grocery shopping. Both low-mileage 2012’s the bikes were in good condition and created no drama – just the way we like it. The accommodations. The hotels we stayed in were all middle-of-the road, Holiday Inn Expresses and their equivalents, basically the same quality of hotel we normally stay in when travelling on our own dime. As noted earlier they were all easily accessible from the route we were on so no driving around strange cities and towns looking for the hotel. With only one exception all had breakfast included, one even allowing me to fulfill my annual craving for Froot Loops! Most were also located within easy walking distance of restaurants providing a choice for dinner and/or a local pub for a pint after a hot (or wet) day on the road. And best of all, all were very biker friendly with a couple even letting us store our bikes out of the rain under the front canopy. EagleRider chose their hotel partners well. On this, our last day, we expected a quick, straight shot into Las Vegas from St. George. But first we backtracked a few miles to Washington to visit Zion H-D for the requisite tee-shirts where we encountered a group of 20 or so riders from Japan, complete with an accompanying photographer. We would cross paths with them a couple more times on the way to Las Vegas and even had our pictures taken on the road, to end up in someone's electronic scrapbook or, more likely, in the bit bucket. Back in St. George we picked up the ladies, checked out of our hotel, and hit the road on Hwy 15. Then we rode into the Virgin River Canyon. After all the riding we'd done over the past 7 days I think this was the best canyon riding of them all - 30 or so miles of high-speed curves, high canyon walls, and (again!) spectacular views. This bit of road by itself is worth a day trip from Las Vegas in my opinion. By the time we exited the canyon the temperature was 100 degrees and there we encountered the long straight shot into Las Vegas. It was a very HOT ride and in less than an hour the initial symptoms of dehydration could be felt. But we were then in the outskirts of town and so pressed on to Eagle Rider to return the bikes before heading over to the strip to check in at MGM, which was to be home for the next 3 days. And, sadly, that's then end of the adventure. We had a great time, riding good roads with great travel companions, seeing amazing sights and vistas long dreamed of, and taking hundreds of photos and hours of video which now have to all be viewed, culled, and edited. Now it's time to start planning the next trip. Europe, perhaps. Day 7 - A day of 'ests'. This, our penultimate day on the bikes, turned out to be a day of extremes, from the coldest to the hottest, the highest, the longest, and the scariest. Fortunately it was not also the wettest as it turned out we only needed our rain gear for an hour or so at midday. When we left Torrey at 7:30 AM it was less than 40 degrees and promising to get colder as we climbed up the side of Boulder Mountain. A heavy dew the night before meant that the roads were still very wet. Feeling the air get colder as we climbed, combined with all the Icy Road signs, did not make for a very comfortable ride for the first while. The fact that cattle were wandering loose all over the road didn`t help either. However soon enough we reached the summit (9,600 feet) and started the ride down little knowing that the most interesting riding was yet to come. Just south of Boulder you hit the 'knife edge' as the road follows the Hogsback Ridge. In places the road is a very narrow two lanes wide with a 3 or 4 foot shoulder on either side, then oblivion as the sides fall away hundreds of feet to the valley floor on either side. With no guardrails or other barriers to stop you, oncoming RVs hogging the middle of the road, and swirling crosswinds it's definitely a scary ride. You do not want to be less than 100% focused on your driving when crossing this ridge. We continued through Escalante to Bryce Canyon where we stopped to view the hoodoos and take a short walk down into the canyon. Due to time constraints we only had a couple of hours to spend there but again we were blown away by yet another spectacular and completely different geography from what we had seen to date. The rain and hail started as we left Bryce and stayed with us until we were a few miles from Zion. Again mother nature favoured us with nice weather when it really counted and it cleared up for our ride through Zion. Another gorgeous ride in a spectacular setting! By the time we reached St. George it was well over 100 degrees, the highest temperatures we`d seen so far. We`d also done abour 260 miles, making it the longest day of our trip. Sadly it was also the second last-est day of what had been a phenomenal trip. Tomorrow - back to Vegas. Since Arches National Park is literally in Moab’s back yard t back yard National Park is literally in Moab'________________________________________________________________________________hat was the obvious place to start the day. 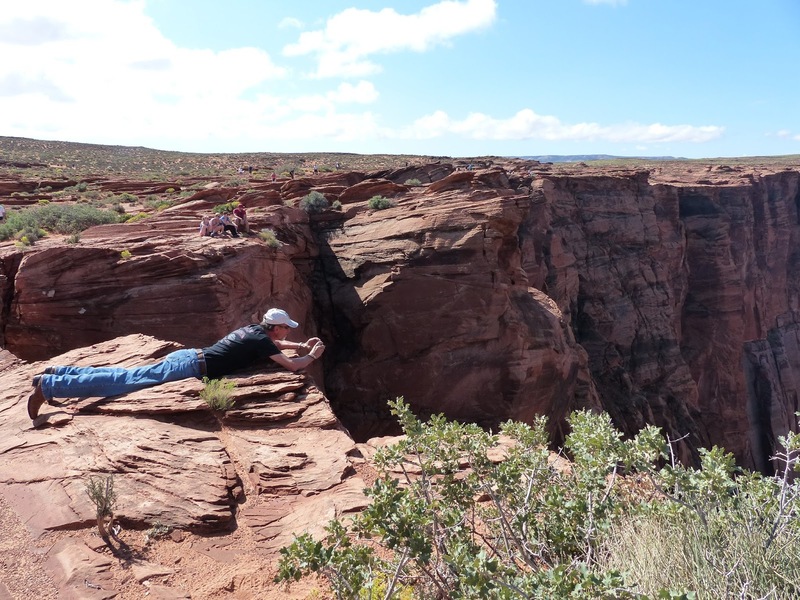 The rock formations were, again, spectacular and completely accessible to the public if you wanted to walk a bit. And lots of people took advantage, crawling all over and through the famous arches posing for photos and just enjoying the beauty of the location. This is also where the best advice of the day, indeed the trip, was found. The sign said “If you hear loud cracking noises, move away from the rock.” Seriously? People need to be told this? At the north end of the park we encountered the rain and hail we’d seen from a distance which then stayed with us for the next half-hour or so until we left the park. The skies cleared as we took the scenic route 128 north to I-70. This road, also known as the Dinosaur Diamond Prehistoric Highway, runs through a narrow canyon alongside the Colorado River. At times you are literally riding 3’ from a vertical wall rising hundreds of feet overhead. Watch for falling rocks signs are everywhere but if any of those rock faces separate (which they do on occasion) a sign won’t do you much good. But it's a great ride and if you are ever in the area well worth the trip. One other curiosity. 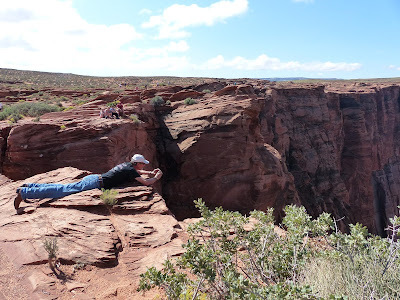 Heading into the canyon from Moab you might experience an interesting optical illusion. It feels like you are actually going down into the canyon, but then you realize the Colorado River is meandering peacefully alongside the road. Where you expect to see rapids there’s nothing but smooth waters. At first I thought it was just me, but my brother also had the same experience. All of the rain in the area caused numerous flash floods across the highways. They all left a residue of fine red sand on the roads which, when mixed with water (from yet another rain shower perhaps) turned to grease. We had a few scary moments crossing these flood areas as front wheels tended to go wherever they wanted and not necessarily where they were being aimed. Fortunately in every case we were across the slippery parts before any disasters occurred. Almost the same time we hit I-70 the rain (and hail!) started again with major lightning storms following us all the way into Torrey where we would stay the night. Dinner that night was one of the best pizzas I’ve had in a very long time, washed down with a couple of glasses of Polygamy Porter (“Why have just one?”). Then it was back to the hotel as day 7 would need an early start. In honour of the Port Dover Friday the 13th celebrations which we were missing we all wore Friday the 13th tee shirts. Well most of us did; one person who shall remain nameless didn’t have one, an oversight to be corrected next summer. Leaving Kayenta heading north on Hwy 163 we passed Monument Valley again. It was remarkable how different the rock formations looked in morning sun versus the late afternoon sun of the previous day. It’s easy to understand how serious photographers can spend days waiting for just the right light conditions because the subject changes so dramatically. We then swung over on Hwy 160 to see the Four Corners Monument which commemorates the only place in the US where 4 states – Utah, Arizona, New Mexico and Colorado – all meet at one point. I expected something significant, but all it consists of is a concrete marker surrounded by the 4 state and Indian flags and numerous native artisans trying to sell their craftworks. And this after paying a $3/head admission fee and having to navigate a muddy gravel parking lot. Having seen how well the authorities had done up other points of interest I was quite disappointed in this site. Nonetheless we took the requisite photos and headed out. North again on highways 491 and 191 towards Moab we stopped to spend a few minutes at Wilson Arch which was worth the stop for sure as it’s quite beautiful. Just as we were about to leave the arch the rain started again and chased us all the way into Moab. But the real heavy downpour, including 4” hailstones, kindly waited until we were checked into our hotel, which, conveniently enough, was located right across the street from the Moab Brewery and Restaurant. Of course we went there for dinner. The beer was excellent, the food was good, but the helping sizes were huge. In spite of our best efforts there were still some steak pieces and sausages left on our plates when we were done. The waiter asked if we wanted carry-out. When we explained that we were in transit he then asked if we’d mind if he took them for a snack at “the big game” tomorrow. That was a first for all of us but we said sure. We hope he enjoyed his leftovers. Afterwards we went for a walk down the main street of Moab. It seems to be a very artistic/outdoorsy place and we discovered a great art gallery. This is where being on a motorcycle can pay for itself as there’s no room to bring “just the perfect thing for the garden” home. And I was careful to not point out the “We ship anywhere” signs. The rain started again as we headed back to the hotel and the electrical storm and light show continued most of the night. It’ll be another wet seat on the Harley tomorrow. This was our shortest leg of the trip at about 100 miles over to Kayenta. It was a beautiful morning, hot and sunny, as we stopped at the Page overlook to get a view of the Glen Canyon Dam. With clear skies the panorama option on our cameras got a good workout. Coming from a part of the continent where we’re surrounded by trees these wide vistas are truly remarkable. After dinner that night we were entertained by an amazing light show as a major electrical storm created it’s magic over Monument Valley for an hour or more. I much prefer seeing it from a distance rather than up close and personal. And we didn’t have our rainsuits on once!